I’ve never really been a “car” person. My first car in college was a tomato soup red colored Nissan Sentra, with crank windows and no air conditioning. I have mixed memories of this car. I usually tell people that I find envy a useless emotion, and that when I feel a twinge of envy, I try to use it as inspiration. Once, however, when I was rotting in Boston traffic after getting out of class, on a baking hot afternoon, there I was practically parked next to this pretty blonde woman driving a convertible white Mercedes with her cute little ponytail and her Louis Vuitton handbag on the passenger seat. This image remains as one of my most vivid moments of shear envy. On the opposite end of the Nissan line, a good friend of mine bought a gold metallic 300ZX. I remember her once teasing me about my tomato can red Sentra, and I promptly replied, “Yeah, but my car takes us to the beach and it’s okay if sand gets in it and we take my car to park in Boston (who’d steal it? ), and my car goes out in the rain and snow, and reliably takes us from point A to point B.” Despite my vivid memories of the blonde in the convertible, I’ve never really attained my “dream car.” I have three boys, and am a mobile disc jockey, I drive a minivan. So I’m at a self-serve gas station the other day, which I rank right up there with waiting for my nails to dry after a manicure as a complete waste of time, and I hear some guy on the other side of the tank let out a huge sigh. I say out loud, “I know just how you feel, it’s a drag just pumping gas.” He peeked his head around the corner and laughed and said I was the nicest person he spoke to all day. Now Bill (we were on a first name basis at the end of the fill up) and I went on to have a nice conversation while we refueled, but it got me thinking about how differently we look at fuel for our car and fuel for ourselves. Imagine you’re the blonde in the Mercedes and you drive a fancy sports car. You also wouldn’t want to put cheap gas in it causing knocks and pings, would you? Yet a lot of us choose junky food with little nutritional value for our own bodies. Also, the idea of gas in the tank of your car is to get you someplace, where we’ve started to consider food as the destination, instead of the fuel to DO something. 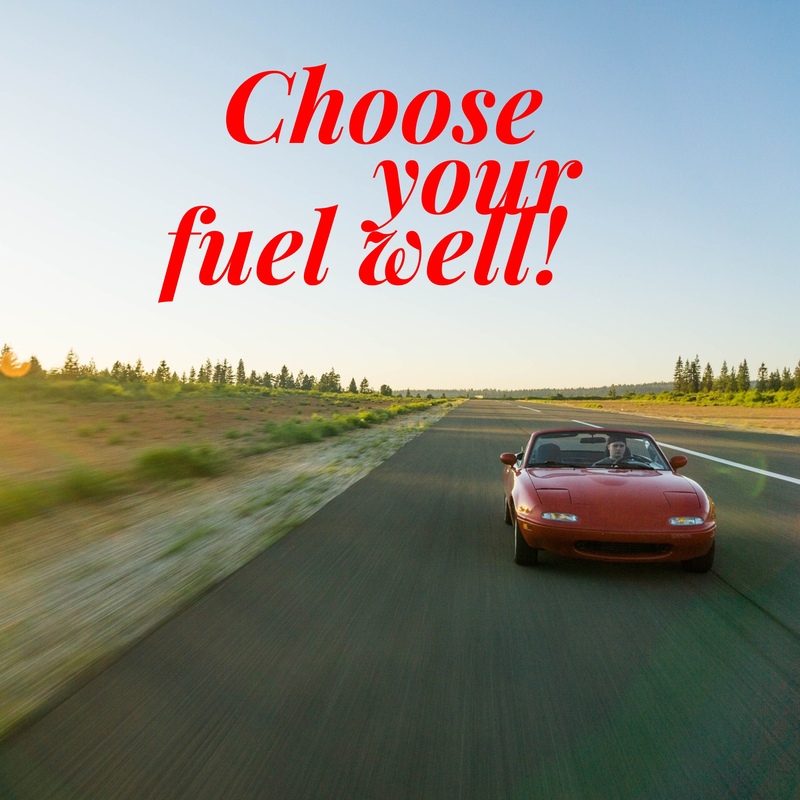 So ask yourself: Do you want to fuel your body like a clunker or a fine sports car? I consider myself a Mercedes, but sometimes I eat like a Gremlin…and feel like a jalopy!